The location was in the parking lot of a hotel near Laurel, Maryland. The "Take It!" 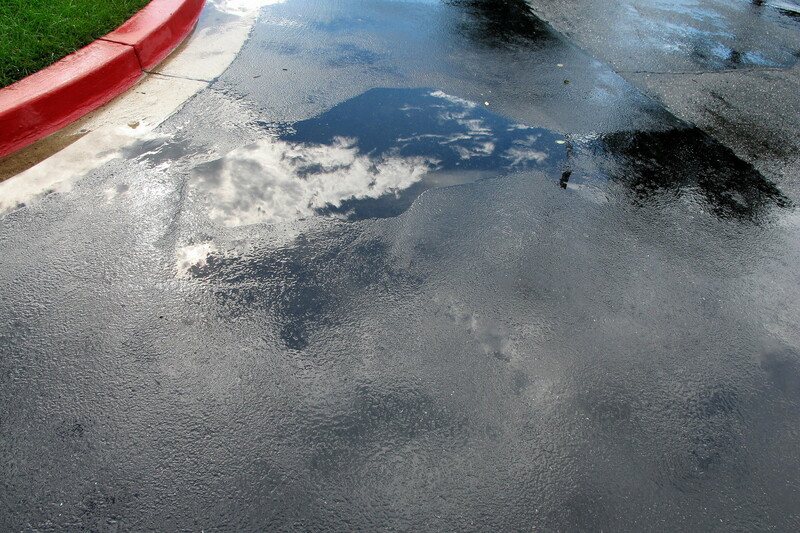 came from having just come outside into the bright sun light after a brief rain and looking at the puddles spread throughout the asphalt parking lot. Each puddle had some sort of reflection coming up off of it for the sun was in full force along with the remaining clouds. I further looked and walked about to see if there might be a distinguishable shape from a cloud that might be reflected in the water of a puddle. I was almost spellbound enough to not reach for my camera in seeing the head of a fox or coyote in this puddle. By the time I was able to focus in and get the puddle shot lined up with proper framing I almost lost all of the recognizable shape in the overhead cloud. As you can see from the below photo, I lost part of the ears and some of the definition of the head in general before I could collect the shot. The After Take: Everyone was quite amused at this set of photos which reminded most of them of the cartoon about " The roadrunner and the Coyote." Some even admitted to the cartoon as being one that they had watched many, many, times over as a young child. It was from this later set of repetitive viewers that I got the biggest reaction from. One of the great joys from photography is the sharing of the catch and waiting for the reaction. This reaction can be the start of many enjoyable stories and or just simple comments. Thanks for taking time to join in on viewing some of my world. Looks like it was clearing up to be a great day. We have a kid that loves jumping in puddles, Id never be able to get a picture like this. At least for the next 15 years or so. 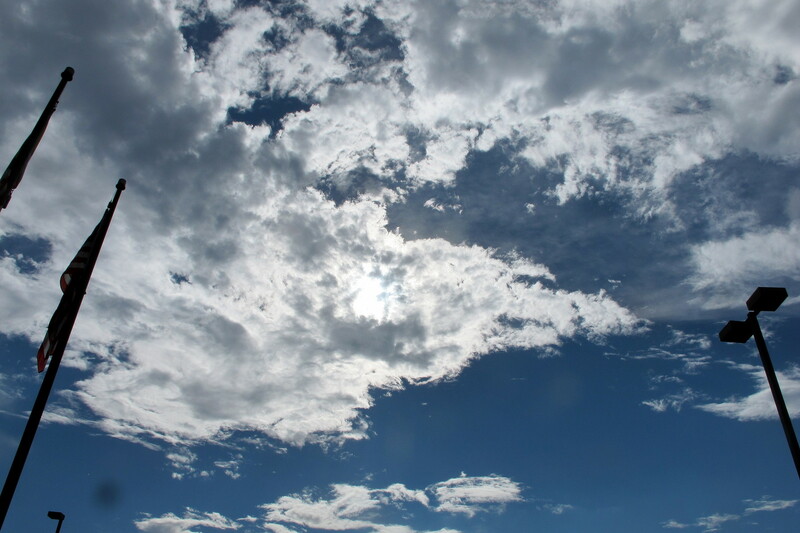 Gotta love that initial break in the sky after a good rain. I received a card for this website today after eavesdropping on a conversation a young man was having about photos with a clerk at a hotel I am staying at. I love nature photos so I asked if I could get a card as well. I didn't catch the young mans name but he was very kind and quickly offered me a beautiful card. He said he did not take the photos but worked with the man that did. I have been browsing through them and I really enjoy the effort you have put into this website. It is such a blessing to see positive sites like this when so much out there is really dreary and sad. Please keep up the excellent work! Send that rain to California......we need it!!!!! I really enjoy coming to this site every couple of weeks. It gives me something to do on my lunch breaks. I can fill an hour easily browsing through the pictures that have been posted since my last visit. To add to what Jeff said, as a teacher this is also something I'd rarely get the opportunity to see. Kids seem to love puddles. Marylin, thanks to you for taking a look at the sight and sharing your conclusions. We try to bring subjects that amuse and sometimes bring question and wonder with photos. I hope you will continue with us as we journey through whatever it is that comes next.